The fight for the freedom and future of the Library is on and the stakes have never been higher than in Smoke and Iron. I didn’t think I could love the Great Library series any more than I already did, but Rachel Caine’s writing had me so engrossed in the story that I stayed up way too late reading and practically zombie-walked my way through work the next day, my biggest goal to get home and finish this book. It’s just that good. Jess, Khalila, Morgan, Thomas, Glain, Dario, Santi, and Wolfe are locked in a deadly game of cat-and-mouse with the Archivist. And as certain members of the group are completely on their own as of the end of Ash and Quill, even just surviving is harder than ever. I’m not going to talk about the plot of Smoke and Iron because doing so even a little could spoil readers’ enjoyment of the story. I will say that we get more points of view in this story as everyone is spread out and I loved getting inside the heads of more characters. The first three Great Library books made me care about them all, but the more time I spend with each member of our main band of heroes, the more they grow, the more I adore them. Khalila in particular was the breakout star for me in this book and it was fantastic to see her fully come into her own. Her brilliant mind is matched only by her quiet strength and compassionate heart and, quite simply, she rocks. 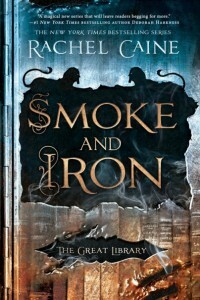 In Smoke and Iron Ms. Caine weaves together multiple intricate plots, each with dire consequences. I absolutely loved that Ms. Caine constantly kept me guessing as to what would happen next and who would come out alive. I haven’t been this tense and uncertain about beloved characters’ fates since A Song of Ice and Fire / Game of Thrones. 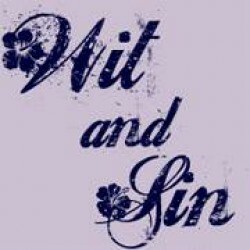 Alliances are forged and broken, trust betrayed, love questioned, and more, and I am so there for all of it. The result is a pulse-pounding read that finishes in a spectacular climax. If you haven’t read the first three Great Library books (Ink and Bone, Paper and Fire, and Ash and Quill), then you definitely want to get caught up before jumping into this story. Smoke and Iron is an utterly enthralling read. The world of the Great Library is fascinating, the characters unique, and the action intense. The only downside of this book is that I finished it desperately wanting to know what happens next!